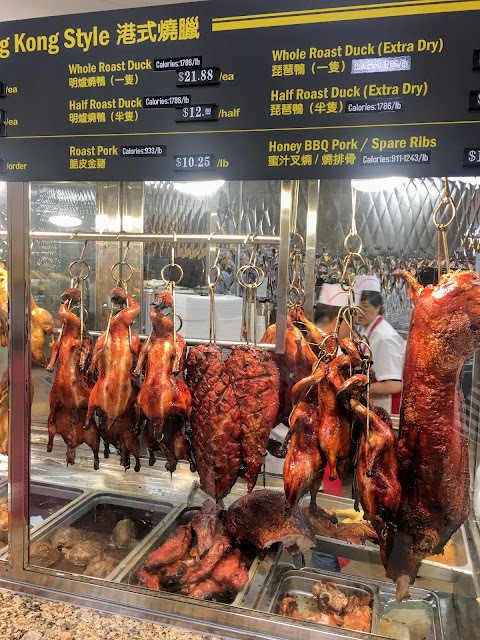 FILLING MY TIME: One way I've tried to fill my time is to continue writing about food and cars -- two areas I covered at The Record of Hackensack in the years before I was forced to retire in 2008. I devoted a third Google blog, Eye on The Record, to the steady decline of the local daily newspaper where I had worked for nearly 30 years. The photos, above and below, are from 99 Ranch Market, a Chinese supermarket that opened in Hackensack in June 2018. HACKENSACK, N.J. -- In May 2008, I suddenly found myself out of a job after nearly 30 years as a reporter, copy editor and food writer at The Record. Filling my time now remains as much of a challenge as it was then. "You're retired, now what?" was the first of a dozen questions I asked to start what turned out to be a lively discussion. Another was, "How would you describe retirement in one word?" At the time, my one-word answer was, "Boring." Preparing for the trial of an age-discrimination suit against The Record. Starting blogs to continue writing about cars, food and other subjects I explored as a reporter and food writer. Becoming active on Twitter and other social media to remain relevant amid the rise of white nationalism. Running for City Council and Board of Education in Hackensack, where I live, and blogging about the impact on property taxes of Hackensack University Medical Center and other non-profits, and other local issues. Having open-heart surgery and getting a new valve (from a cow). Holding part-time driving jobs for what basically was chump change. Volunteering as many as 3 days a week at a hospital or day care program for people with Alzheimer's disease or dementia. (The definition of a volunteer: An older American who has nothing better to do). Giving up meat and poultry in favor of eating only seafood, spending a good deal of my time food shopping and preparing meals at home, and emphasizing organics and wild-caught fish. Starting a cooking channel on YouTube. Rosy views of retirement, such as the article that appears this month in Costco Connection magazine, don't help (see more below). Call us senior citizens, retirees, older Americans or what you will. But leaving the work world can expose you to mistreatment or discrimination whether you seek part-time employment or volunteer. "More than half of older U.S. workers are pushed out of longtime jobs, suffering financial damage that is often irreversible." ProPublica, a nonprofit newsroom that produces investigative journalism in the public interest, and the Urban Institute, a think tank, analyzed data from a study that followed a nationally representative sample of about 20,000 people from the time they turned 50 through the rest of their lives. "Besides attending classes here, how do you fill up your time? "What takes up most of your time -- hobbies, grandchildren, travel, volunteering or something else? "Do you feel The Record and other media are paying attention to your concerns as a senior citizen? "Have you seen any articles on staying busy during retirement? "Would you describe yourself as affluent, well off or financially stable?" Luckily, finances have never been a concern since I was forced to leave The Record in 2008. My wife and I, and our college-age son live comfortably. I own my home free and clear, and in 2015, I used $30,000 from my retirement fund for a down payment on an all-electric Tesla Model S, which I charge with the 60-plus solar panels on our roof. When I took part-time jobs, my goal was to fill my time and earn a little pocket money. One job I didn't get was as a part-time product specialist in Tesla's Paramus showroom, where I venture to guess no worker is over 35 years old. For all his accomplishments, Elon Musk, the genius behind Tesla and SpaceX, appears to discriminate against older Americans like me. "Are you concerned about talk in Congress on cutting Social Security and Medicare? "Do you want more opportunity to interact with younger people -- in this [college] setting or elsewhere? "Do you feel isolated or do you feel you are a valued member of society?" 5 STEPS: The cover of Costco Connection, a magazine for members of Costco Wholesale. 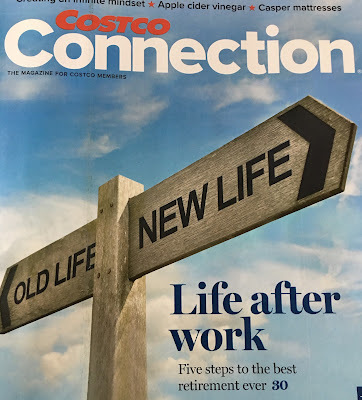 The cover story in the January 2019 Costco Connection, a magazine for members of Costco Wholesale, quotes "several experts to provide tips and advice for the road ahead," according to the table of contents. Editorial Director Tim Talevich says, "The common theme among the experts ... is that your retirement can be truly special, if you prepare as much as possible. "Find out about Medicare, Social Security and those other essentials. Spend some time examining your values and strengths. Then go out and create the best life for yourself, your family and your community."